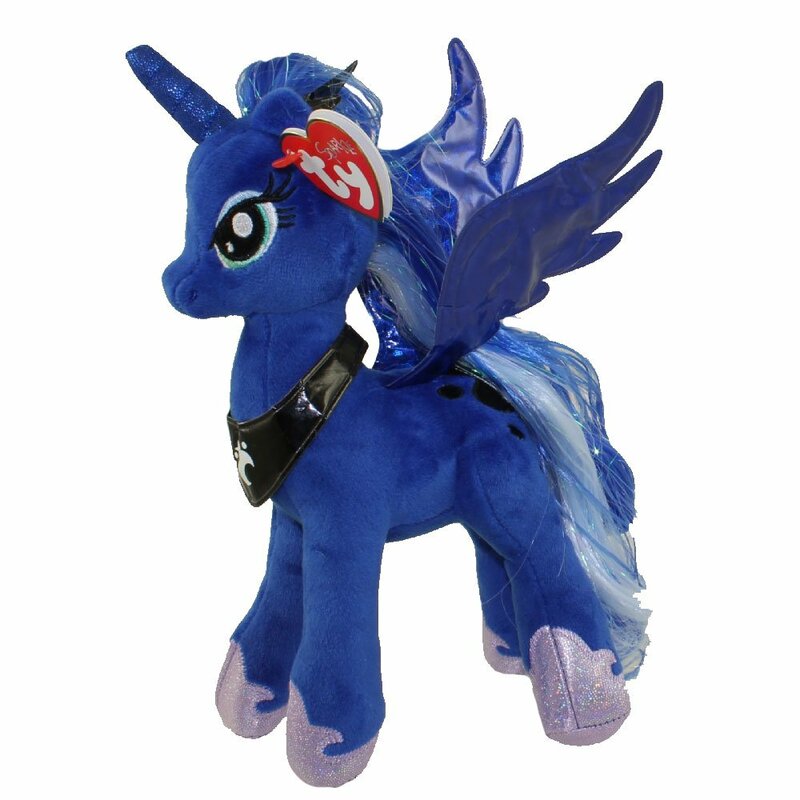 We've picked out some of our favorite selection of My Little Pony plush toys to buy. 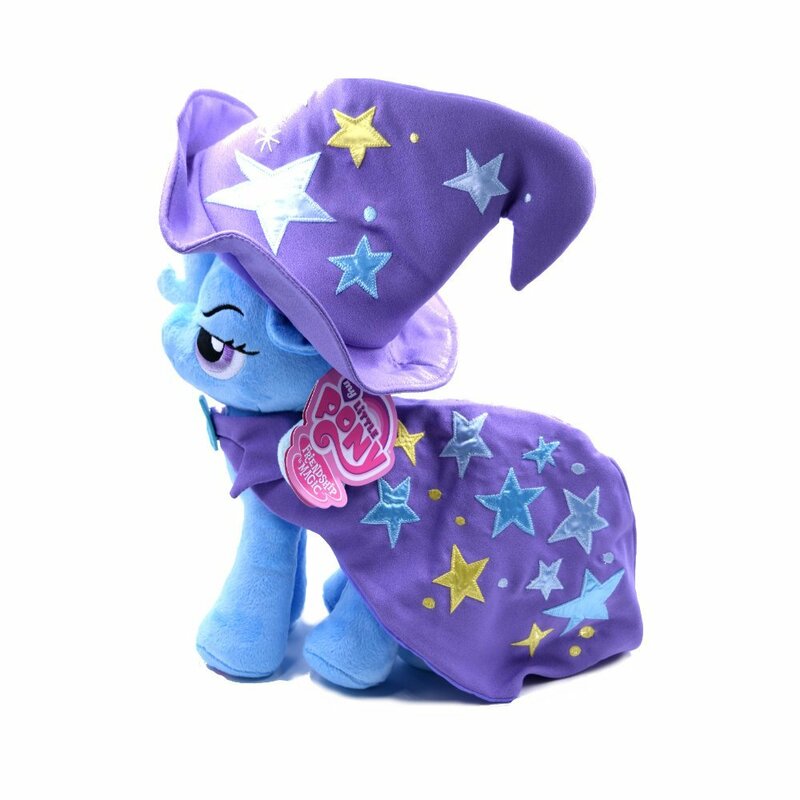 These soft little horses are ideal to cuddle and should make very sweet gift choices for fans of this cult series. Every girl should have one, I think. These soft and huggable versions of this pony, though not as collectible, they are definitely much nicer to hold and play with. I loved My Little Pony toys as a little girl and now I’ve passed that craze rather firmly onto my own daughter. Rainbow Dash is our special and most favorite MLP character, partly because of the stunning and gorgeous rainbow color hair and partly because she can also fly too. She’s no ordinary horse at all but a rather unique Pegasus fantasy breed which makes her well and truly magic. This is an 8 inch Ty Beanie Baby soft plush and much nicer I believe to cuddle than the hard, plastic collectible pony figures. 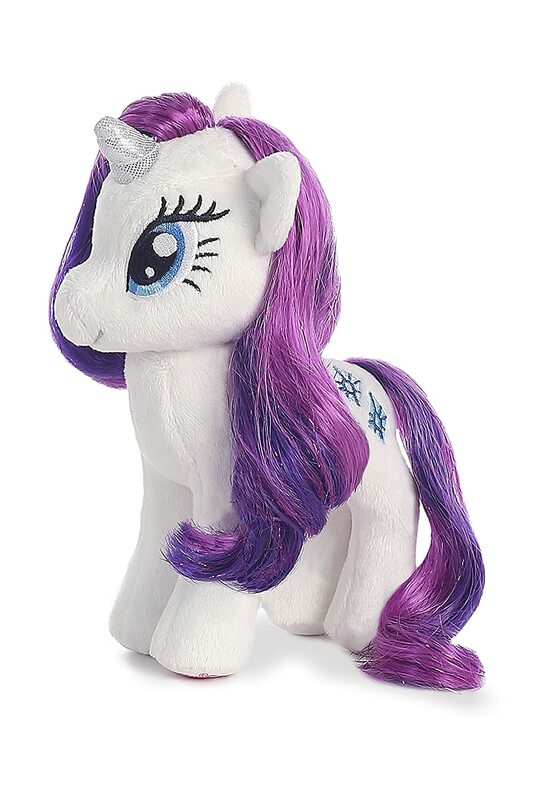 The added bonus is that these soft toys actually come with hair that you can comb out and style just as you do with the regular MLP line. It should be both light and small enough for kids to pick up and carry around in a bag with them. Why not take some fun hair accessories along for lots of added play value too. 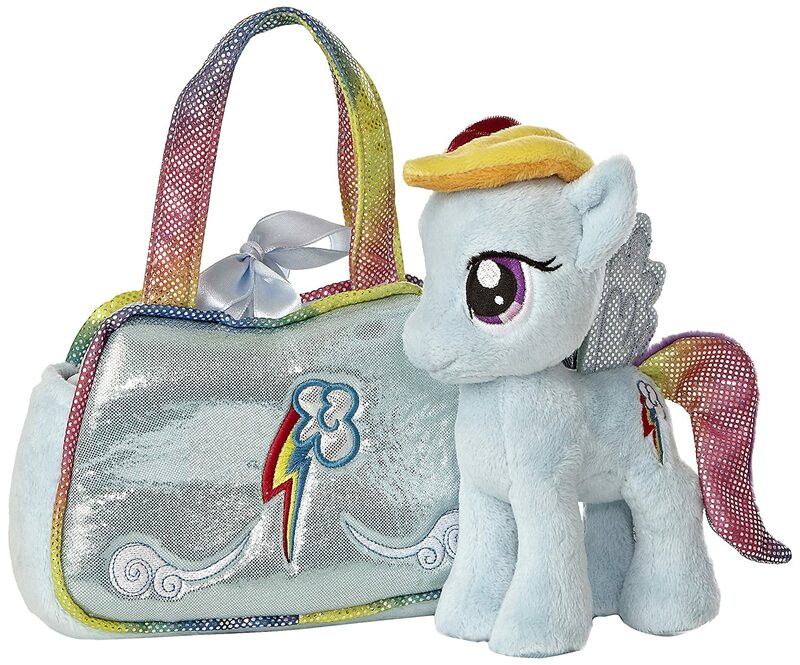 What a totally adorable looking and really sweet little gift set that this might make a little girl with a small and also soft to hold Rainbow Dash plush toy along with a cute and matching carrier purse that she can squeeze into as well. Each bag has the character name emblazoned across one side and also the character symbol on the other so that young kids can easily match up their own My Little Pony plush with the purse that it came with. 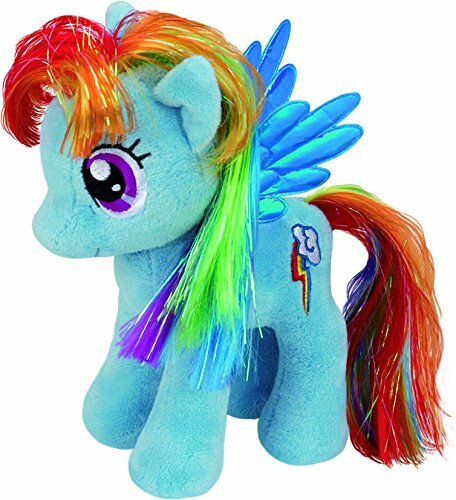 Rainbow Dash comes with a pair of sparkly wings and also a sparkly colored tail too. She looks like complete magic. 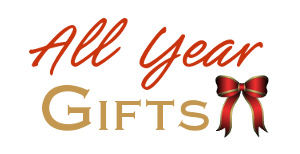 Young girls especially can enjoy taking their favorite MLP out with them wherever they go and there are different ponies available to select from if you have more than one that you want to buy too. Pinkie Pie is my all time second favorite MLP after Rainbow Dash, mainly because I also love the color pink. This adorable looking little sweetheart is a small soft plush toy. I believe she should delight pony fans both young and old. I love that she has super big eyes, the cutie mark on one of her flanks and her amazing curly hair with strands of glitter in which of course can be styled to perfection. This is a totally adorable looking version of this super cute character and it will hopefully make for a really awesome gift for a fan. I just don’t know which one I shall choose for my own little girl this Christmas, I might need to collect more than one since I cannot easily decide. 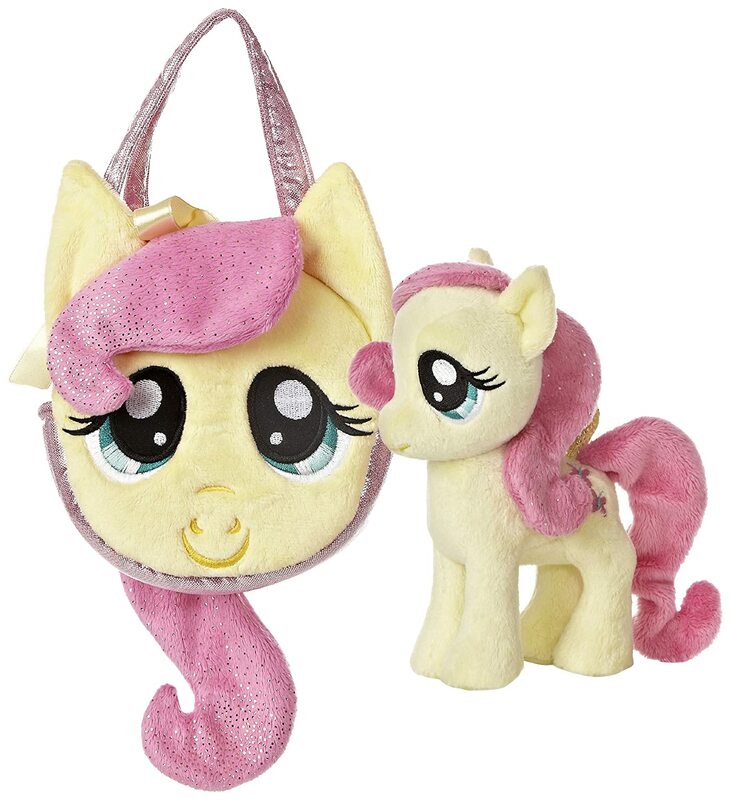 Girls who are really fans of the very cute Fluttershy character should be delighted to receive such an adorable looking and inexpensive gift in this mini purse bag and Fluttershy plush pony combo. The round shaped bag features the character face of Fluttershy herself with huge eyes and embroidered details and it also has the ears plus a really sweet swirl of fabric mane with sparkles. The back of this bag features a pretty plush tail and there are shiny handles to carry it with. The soft toy is made to match with the same materials and she fits neatly inside the carrier with her head poking out. Young fans should like this adorably cute and mini little set, not shown, consisting of a soft plush pony toy and a matching carrier purse bag that it can be popped into to hitch a ride. 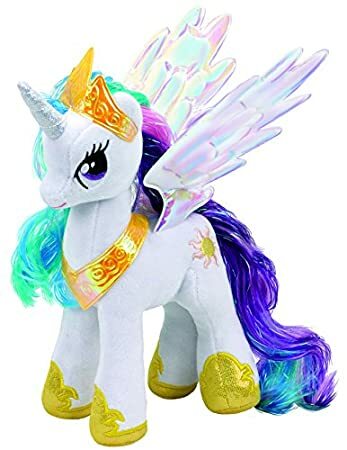 This horse is called Twilight Sparkle and she comes with embroidered details like the big eyes and the cutie mark on her flank area and on the front of the bag too. There is a mini set at approx six inches tall but it’s also one that I think is inexpensive too so that could make it very good for a little birthday or Christmas gift for a younger fan of the series. With matching carrier purses, girls can enjoy carrying around their favorite pony character in the bag to play with her all day long. There is a newborn plush, not pictured, that is actually more of a cross between a plush and a doll. 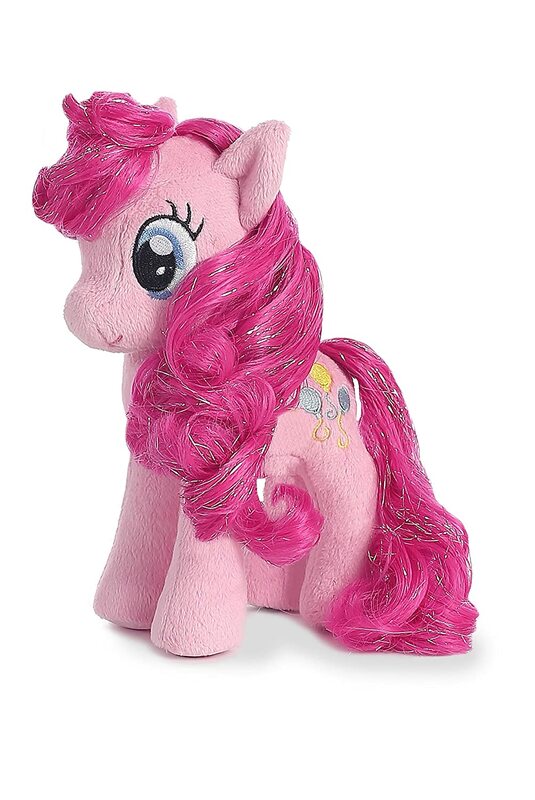 Younger girls can enjoy looking after their newborn little baby pony with this adorable little version of a baby Pinkie Pie from the MLP range. This toy doll figure is pretty unique in that it has a soft squishy body to cuddle with a hard head. She comes with her own baby bottle, spoon, bowl and a bib that can be taken on and off. Little girls may well enjoy playing mommy horse to this sweet little babe and they can pretend to feed it, change it and give it lots of hugs and cuddles too. She has an adorable little tuft of fuzzy hair at the top. I think this one is ideal particularly for the younger 3-5 year old age group who will get the most enjoyment from this toy. Which one is your favorite, you can let me know in the comments. My little girl is rather keen about these cute fantasy horses as well. Our joint favorite one is Rainbow Dash because she is blue with a wonderful mane and tail of rainbow colored hair to brush and style.